NEWRY, ME (September 23, 2018) - Not even a 30 minute frost day Sunday morning could cool down Maine Mid-Amateur winner Jack Wyman. Leading by two shots at the start of the final round, Wyman fired a closing 3-under 69 to finish the tournament 3-under and in the process runaway from the field on his way to a nine shot victory at Sunday River Golf Club. The victory for Wyman, who played in the U.S. Amateur at Pebble Beach last month, was his first Maine Mid-Amateur title to go along with victories the last two years in the state amateur. After opening with an even-par 72 on Saturday, a round that could have been much better hadn't it been for a final hole triple-bogey, Wyman wasted no time in pulling away on Sunday. Wyman came out of the gates firing with birdies on the first two holes and after a par on the 3rd he added two birdies on Nos. 4 and 5 for a 4-under in five hole start that essentially put the tournament away just a handful of holes into the final round. 4-under for the tournament after the early birdie barrage, the former Endicott College standout did give shots back on the 9th and 14th holes but by the time he made the turn his lead had already swelled to seven shots over Scott Sirois who started the day in second place, a couple of shots back. With the lead sizable the mid-round bogeys proved to be harmless as Wyman rebounded with a birdie on the par-5 15th, his fifth of the day against two bogeys, before parring his way to the house. Sirois took second place with a 6-over showing, Mike Doran was third at 9-over, in fourth it was Jason Macdonald at 10-over while Ashley Fifield was 11-over in fifth. Defending champion Peter Wright settled for a 14-over finish that left him in a tie for 9th. Contestants must be at least 25 years of age. 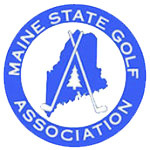 The tournament is restricted to amateur Maine residents, except that non-residents who have been members of MSGA-affiliated clubs for 10 years and who reside in Maine for five months annually are also eligible. Format is 36 holes of individual stroke play.